City of Gold is a 5-reel 20-payline slot themed around El Dorado, a legendary city of gold in the Aztec Empire. The symbol set includes a golden mask, a massive necklace, and other themed imagery as well as traditional playing card icons. A player may adjust a total bet from as low as $0.05 to $100 per spin. 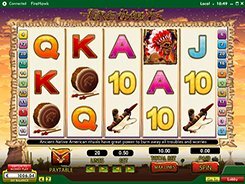 The slot is fairly simple in terms of features and offers a wild, a scatter and a free spin round. The first, second and third largest prizes that can be won in the slot are $30 000, $15 000 and $10 000. A wild symbol represented by the Temple replaces for other icons except for a scatter, which in this game is the Archway. Hitting three or more scatters awards 15 retriggerable free spins, during which all winnings are trebled. In addition, spinning in five scatters in any position results in a win of your total bet multiplied by x100. To sum up, City of Gold is a simple-to-understand and visually catchy slot that would be great for novice players. PLAY FOR REAL MONEY!